Of course, if I see any more hints of either record heat or cold I’ll post that information. 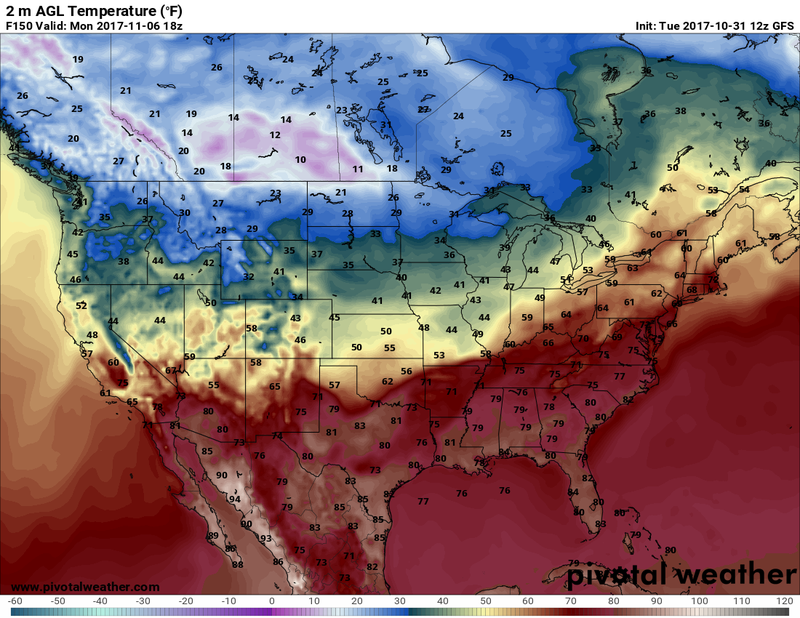 Records get cataloged into the system in “spurts” when there is a synoptic pattern hot or cold enough to attain extreme temperatures across part of the nation. 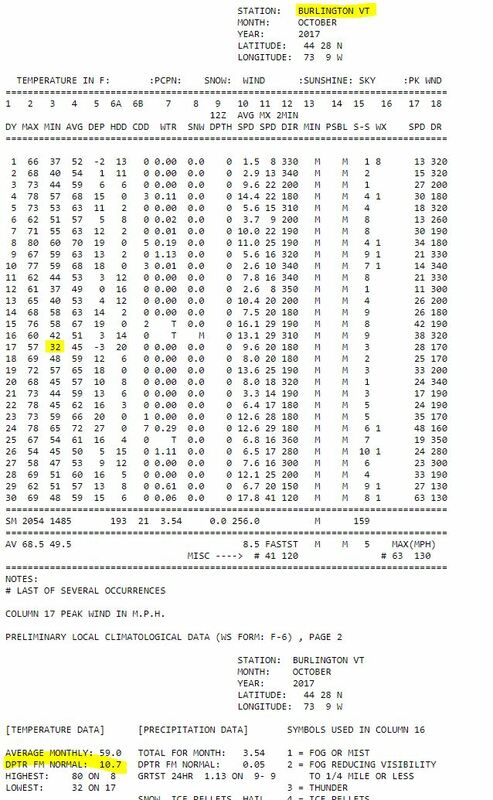 Usually if temperatures are extreme enough to get a new record at say a main line station such as Pasadena CA there are many other records set at surrounding minor stations; hence we see a “spurt” of new record reports getting into the system, especially if it gets hot or cold enough to get new monthly records. In the case of the latest heat wave the system did report one new monthly record at Heber AZ, which got up to 91F on 10/23. 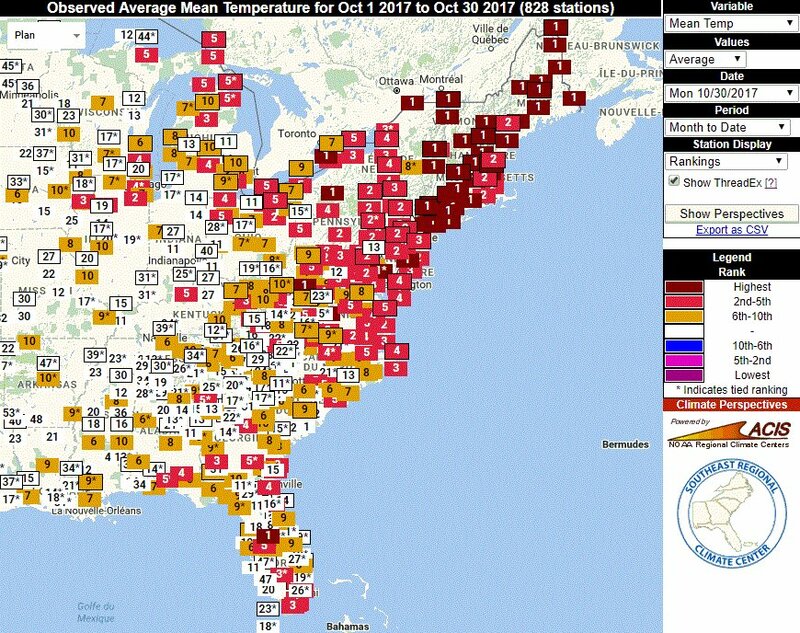 I suspect that it will take a few more days to see more complete reports of daily and monthly records from 10/23-10/25. I’ll update this post once more come in. 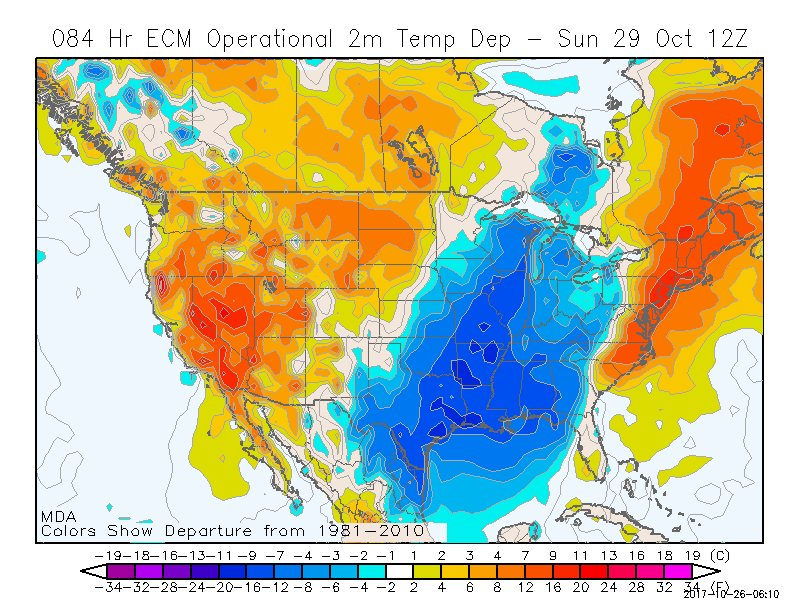 In order for October 2017 to not go in my record books as the 35th consecutive month of more DRHMX than DRHMN in the U.S. the “cold team” is going to have to throw some hail Mary passes. Due to the current cold wave across the Midwest and eastern U.S. the cold team has a shot, but I think they will come up short. We will see. Here we see that the negative phase of the North Atlantic Oscillation that I described yesterday has been replaced by the positive phase…A ridge over Greenland is forecast to be replaced by a cold upper low (in this case centered north of Hudson Bay). 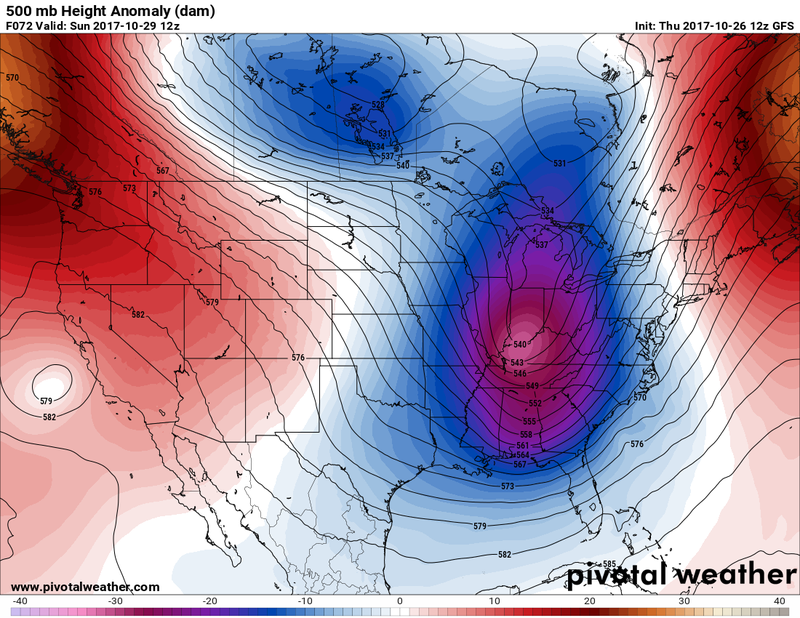 Usually the positive phase of the NAO allows a heat dome to build over the eastern U.S. So far, there are no indications of widespread record warmth coming to the East from this pattern change, but I’ll keep all informed on any changes. Quoting my friend Bob Henson of the Weather Underground Category 6 Blog: “Irony alert. 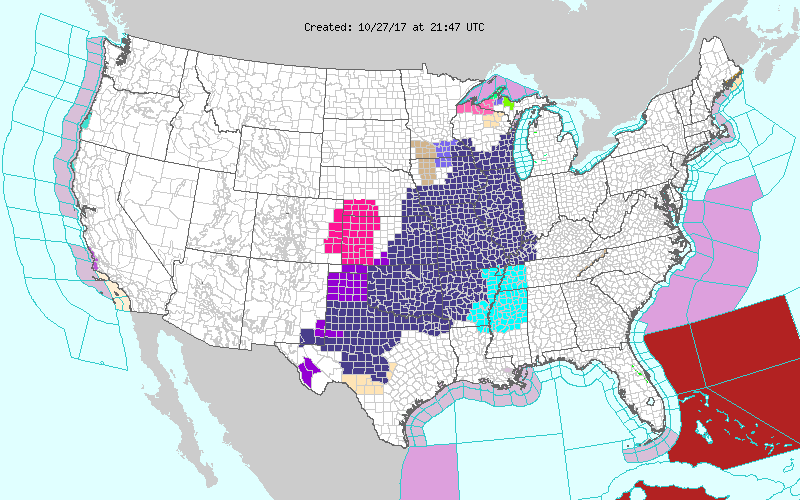 The freeze warnings are so widespread because there’s been so little freezing weather thus far.” Yes, due to climate change first frost and freezes are generally coming later in the year. I’ll add more to this post as pertinent information crosses my radar. 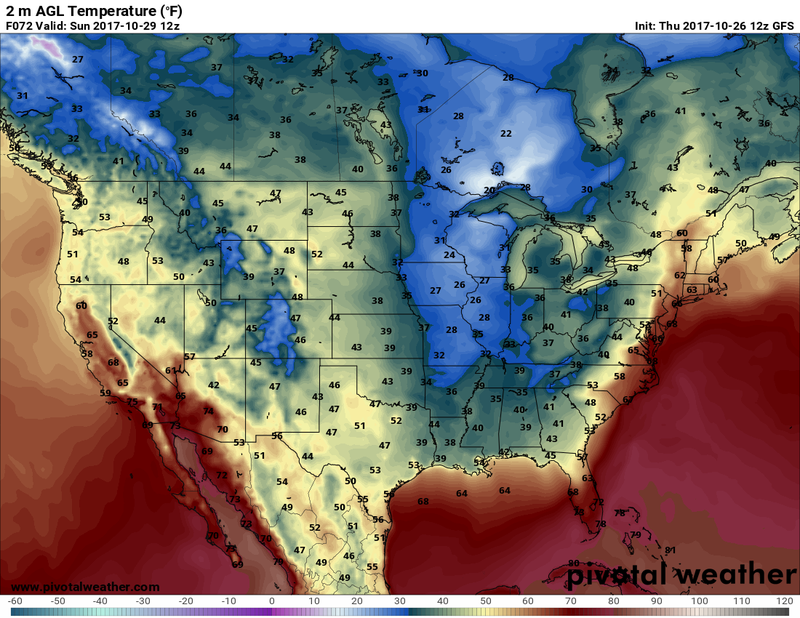 Indeed, the latest GFS forecasts chilly 30’s as far south as the Gulf Coast Sunday morning. I am very certain that we will see this cold outbreak since the white lines(operational model) looks like a good average of all the green, blue, and red lines (ensemble members). 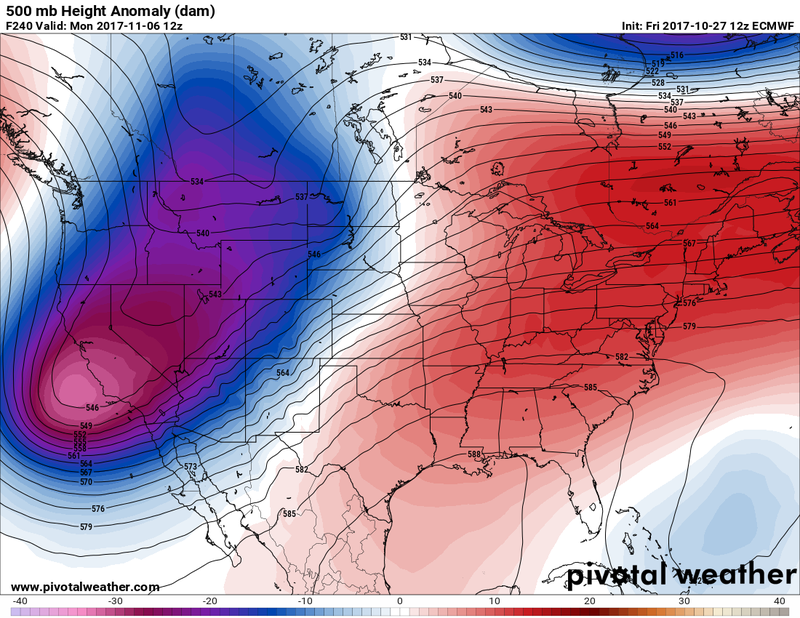 These days of AGW it takes a strong, anomalous pattern to produce any record cold. Keep in mind, though, the Meehl Record Study that I was a part of forecasts that there will be record cold patterns, occasionally, all the way through the end of this century. I’ll be adding more to this post as relevant information crosses my radar. Here in NW Missouri we got a Halloween treat, snowflurries!